We’d love your help. Let us know what’s wrong with this preview of Turn the Ship Around! by L. David Marquet. "Leadership should mean giving control rather than taking control and creating leaders rather than forging followers." David Marquet, an experienced Navy officer, was used to giving orders. As newly appointed captain of the USS Santa Fe, a nuclear-powered submarine, he was responsible for more than a hundred sailors, deep in the sea. In this high-stress environment, where "Leadership should mean giving control rather than taking control and creating leaders rather than forging followers." David Marquet, an experienced Navy officer, was used to giving orders. As newly appointed captain of the USS Santa Fe, a nuclear-powered submarine, he was responsible for more than a hundred sailors, deep in the sea. In this high-stress environment, where there is no margin for error, it was crucial his men did their job and did it well. To ask other readers questions about Turn the Ship Around!, please sign up. The rating is for the book, not the content. The ideas and concepts the book brings up are quite interesting and sound like they would be quite useful to many organisations. However, it's written in a simplistic structure that came off cheesy and often annoying. The writing, in general, was amateurish and the narrator for the audiobook (who happened to be the author as well) did a pretty horrible job. The feeling I got from the whole experience was that the author managed to get some success wit The rating is for the book, not the content. The ideas and concepts the book brings up are quite interesting and sound like they would be quite useful to many organisations. However, it's written in a simplistic structure that came off cheesy and often annoying. The writing, in general, was amateurish and the narrator for the audiobook (who happened to be the author as well) did a pretty horrible job. The feeling I got from the whole experience was that the author managed to get some success with a new leadership methodology and let that success get to his head. The tone felt very pretentious throughout the book which really didn't endear me to the author. The format for all the anecdotes was to point out a problem that occurred, followed by explaining the solution they used and ending with the lessons they learned. This simplistic structure led to the reader having to make some leaps of faith when trusting the generalised concepts since many of the situations were very context and person specific. Another issue with the generalisations was that they often made things sound easy to implement, which if you actually stop and think about them, would definitely not be. Although he adds a caveat at the end of the book regarding how his system needs customization for every organisation, there's a lot of prerequisites required in an organisation before considering implementing his ideas. This is one of those books that is hard to put down. Easy to read (even though I don't know anything about the Navy or submarines) while it is PACKED with so much leadership truth. My favorite part? It's not a "this is the way things must be done" kind of book. He raises serious problems and tells you how he attacked them. He shows his strengths and weaknesses in leadership. I greatly appreciated this read. If a nuclear submarine could gain leadership at all levels by giving control, building competence and achieving organizational clarity, your enterprise has no excuse to continue exploit people in a command & control environment like it's still 1900's. Great book with inspiring stories, illustrating the leader-leader model step by step. Highly recommended to read for people who are in charge of other people, as well as people who have other people in charge of them. To be honest - I have never had a strong interest in military-oriented reading material, fiction or non-fiction. Aside from my interest in pre 20th century piracy on the high seas (more of social class/mobility angle here) - I haven't really read any books about life on boats or submarines. David Marquet has written an incredibly clear and easy to understand book - that happens to be about submarines and their crews. The details about life on the submarine are sometimes a bit more than my interes To be honest - I have never had a strong interest in military-oriented reading material, fiction or non-fiction. Aside from my interest in pre 20th century piracy on the high seas (more of social class/mobility angle here) - I haven't really read any books about life on boats or submarines. David Marquet has written an incredibly clear and easy to understand book - that happens to be about submarines and their crews. 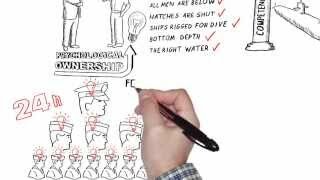 The details about life on the submarine are sometimes a bit more than my interest can tolerate but overall the message about process and changing the structure from leader-follower to leader-leader is crystal clear. His writing style is incredibly well structured and meticulous -- all the examples work really well for his story. As noted in the introduction, the core belief is that we can all be leaders - and the best way to get to that is to have a leader who can help identify the shared goals and vision for the team, and then let them do their work, providing feedback on what is working best as a way to attain excellence (vs avoiding mistakes). This is a system of empowerment that is focused on outcomes, and which worked so well for the author in his command that he DOUBLED the number of chiefs (who then transferred off to other ships the next day to new roles). He discusses situations where team members automatically executed incorrect instructions from their leader or where mistakes were made because someone was operating on "auto pilot." Changing the processes to focus on the outcomes and goals rather than process/method made a huge difference. 1. Achieve excellence - don't just avoid errors. 2. Use "I intend to... " to turn passive followers into active leaders. Avoid disempowered phrases such as "Request permission to . . . I would like to . . . What should I do about . . . Do you think we should . . . Could we . . ." (and I was always told "hopefully"). In empowering the officers to be responsible for their work - "the goal for the officers would be to give me a sufficiently complete report so that all I had to say was a simple approval." 3. Enhance opportunities for informal communication -- encourage team members to "THINK OUT LOUD is a mechanism for CONTROL" and ORGANIZATIONAL CLARITY. Author says "when I heard what my watch officers were thinking, it made it much easier for me to keep my mouth shut and let them execute their plans." This is related to "deliberate action." For example - where there is a process that has a significant impact (whether it's torpedoes or sending out an e-mail blast) - it helps to talk through what you intend so that a peer can catch any potential mistakes before the actual action. "Take deliberate action. We learn (everywhere, all the time). Don’t brief, certify." 4. Search for organizational practices or procedures that would need to be changed in order to effect the change required - that means updating any documentation, handbooks, wiki etc. 5. "Fake it til you make it" - or, as the author says "Acting your way to new thinking" as a mechanism for control. Even if you feel bad - smile - that will eventually make you feel better (it's proven). If you have doubts and don't fully commit to a new thing - it will come through so fake it til it feels natural and only then will you be able to determine the efficacy. 6. Short early conversations make efficient work (another mechanism for control) - this is basically like a daily standup in Agile - it helps to talk through any questions and get an idea of where potential misunderstandings or misdirections may lie. A standup isn't intended to solve all the problems - you may create more meetings out of this but it's a good touchpoint! 7. "RESIST THE URGE TO PROVIDE SOLUTIONS is a mechanism for CONTROL." The leader has to create space for open decision by the entire team; in crisis situations - you can have the team brainstorm and then as a leader vet the best option for action. 8. "ELIMINATING TOP-DOWN MONITORING SYSTEMS is a mechanism for CONTROL." Marquet emphasizes the use of mechanisms that actually give ownership and describes a log of work requests that was owned and maintained but not accessible by the entire team so they could actually see the backlog of work and get things done. He also says to avoid systems where senior personnel are determining what junior personnel should be doing as their day to day tasks - giving them goals and then reviewing their tactics (ie the "I intend to" reports). 9. "EMBRACE THE INSPECTORS is a mechanism for CONTROL, organizational control." Use the opportunities provided by inspection to learn where improvements can be made. 10. "WE LEARN (EVERYWHERE, ALL THE TIME) is a mechanism for COMPETENCE." This was a great section on learning from mistakes without coming down really hard on the team members - everything is a learning opportunity. 11. "DON’T BRIEF, CERTIFY is a mechanism for COMPETENCE." - this was fantastic because instead of the chief reading off the process while everyone else's eyes glazed over, the person who would be doing the task would identify the steps that he would be taking and the others would certify that process was correct (technical competence). 12. "CONTINUALLY AND CONSISTENTLY REPEAT THE MESSAGE is a mechanism for COMPETENCE." 13. "SPECIFYING GOALS, NOT METHODS is a mechanism for COMPETENCE." and CLARITY. Two excellent examples were around fire drills - which weren't going well because of process (ie "I'm not in charge of this area/shift") to make everyone responsible and the crew members CLOSEST to the fire would be responsible for taking action. On the ship, stealth (ie, not making loud noises) is critical so any time some loud noise is made - it can affect the sonar. The goal of a stealth ship was emphasized and everyone was required to report noises instead of the sonar team trying to find the source of a transient noise. This resulted in identifying a lot of other issues that they were able to fix and move even closer toward excellence. 14. "BUILDING TRUST AND TAKING CARE OF YOUR PEOPLE is a mechanism for CLARITY." Providing them opportunities and materials to improve themselves both in their professional and personal goals builds a much stronger, competent and empowered team. 15. "USE YOUR LEGACY FOR INSPIRATION is a mechanism for CLARITY." Note achievements and legacy - these are helpful for guiding the team. 16. "USE GUIDING PRINCIPLES FOR DECISION CRITERIA is a mechanism for CLARITY." Development of guiding principles (see the book - fantastic list created by his chiefs) is critical to empowering a team. 17. "USE IMMEDIATE RECOGNITION TO REINFORCE DESIRED BEHAVIORS is a mechanism for CLARITY." The author would provide immediate positive feedback vs submitting a form and waiting for a process to give the reward/recognition to the individual. He also points out that "Simply providing data to the teams on their relative performance results in a natural desire to improve." 18. "BEGIN WITH THE END IN MIND is an important mechanism for ORGANIZATIONAL CLARITY." The author worked with his officers in weekly one-on-one mentoring sessions to discuss goals and what they wanted their evaluations to look like 1, 2 and 3 years hence -- working with them to develop goals that cascaded down from the organization's goals. This turned into an opportunity for 2-way feedback and the end result was that his officers were able to achieve those goals by the end of their terms. 19. "ENCOURAGE A QUESTIONING ATTITUDE OVER BLIND OBEDIENCE is a mechanism for CLARITY." Absolutnie warta polecania - jeśli chcesz być dobrym liderem, to postawa przedstawiona przez autora jest podstawą! Utwierdza w przekonaniu że nikt nie jest z natury zły i kiepski w tym co robi, często to liderzy sami stwarzają warunki do rozwijania się „patologii”. 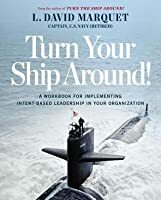 Captain Marquet translates his experiences as a nuclear submarine commander into a book of highly readable and applicable leadership techniques. He discusses his ‘leader-leader’ model (as opposed to the traditional leader-follower) and the three pillars upon which it is built – 1) Control, 2) Competency, 3) Clarity. The book is a fast read, but the approaches he described are not simple or necessarily easy to apply. He sprinkles anecdotes liberally throughout each chapter. I took a lot of notes an Captain Marquet translates his experiences as a nuclear submarine commander into a book of highly readable and applicable leadership techniques. He discusses his ‘leader-leader’ model (as opposed to the traditional leader-follower) and the three pillars upon which it is built – 1) Control, 2) Competency, 3) Clarity. I liked the book, found little to none repetitions and typical management crap. The principles mentioned were somewhat new to me and seem of great value. I’d sum it up as one big team transformation story that acts as a tip book on how to reveal people’s talents via trusting them with owning stuff and creating a culture where continuous self development is a core value and side prerequisites to make it all work. Recommend! Did the AudioBook narrated by the author. From an Audiobook perspective, he wasn't the best narrator. However you kind off got used to his militaristic reading style as the book progressed. Definitely wasn't the worst narrator ever. I do think the book over simplifies how easy it is to change a leadership model or company culture. However, it does have some very valid points in slowly changing some aspects of both management and employees to move in this more collaborative direction. Some of the thi Did the AudioBook narrated by the author. This isn't something that can be simply implemented. It needs to be slowly phased in and evolved. It requires buy in from everyone. It needs constant tweaking/adjustment where things aren't going right. What made this book a bit different for me, is the fact that it wasn't just from the leader perspective, and how you change the model from the top. It also had a lot of focus on all levels of staff, and what is required from them, and what they need to do to make this model work. Although some parts of the book focus a lot on the Navy and the submarine. I think it is well worth the read for some of the principles / ideas. Even though it is not a guide on how to implement the model, it gives enough to spark ideas/curiosity to try some of the things out. This book has some insightful advice aimed at executives and managers-of-managers, but it all kind of boils down to, "be a genuinely good, humble person who cares about others, thinks about the long term, and has no demons holding them back from doing the right thing." It's the equivalent of going to the doctor to ask about your ailment only to find out that the solution is to eat well and exercise regularly. I guess even if I already knew that, a periodic reminder is still a good idea. The advice This book has some insightful advice aimed at executives and managers-of-managers, but it all kind of boils down to, "be a genuinely good, humble person who cares about others, thinks about the long term, and has no demons holding them back from doing the right thing." The advice is hard to follow unless you already happen to be the kind of person the book hopes to make of you. I mean, as written, the advice is probably easy to follow, but following the spirit of the advice requires a larger personal investment. The book is a step by step guide of changes from top-down management approach in organisation like US Navy. Story starts with Cpt. Marquet assigned in charge of submarine with worst results in the fleet, and turns it around within a year to the best one, by changing the top-down (leader-follower) approach to the empowerment (leader-leader) approach. An amazing book. I loved the ideas and practices that were discussed and the case studies that were given. I used these ideas throughout my job and institute the Leader-Leader model with my team members. My direct reports have started to read the book and I am breaching the boundaries of emancipation with them. My boss has even approached me about getting this book for himself. I really like the examples about how the captain transformed Santa Fe's crew. Eye opening in many ways. This book proposes a new paradigm for leadership, the so called Leader-Leader model. This is a model that David Marquet developed and implemented as a commander of the nuclear submarine USS Santa Fe. The construct that David Marquet proposes, Leader-Leader, is explained in three main parts. That is control, competence and clarity. Each part is then subdivided in short chapters where Marquet borrows from his experience commanding the submarine, especially those mistakes where he learnt valuable les This book proposes a new paradigm for leadership, the so called Leader-Leader model. This is a model that David Marquet developed and implemented as a commander of the nuclear submarine USS Santa Fe. Each part is then subdivided in short chapters where Marquet borrows from his experience commanding the submarine, especially those mistakes where he learnt valuable lessons. Solid-sounding ideas, yet less enthusiastically communicated as in the very similar book ”It’s Your Ship.” Often I felt like the book told the ”what”, but not the ”why” or ”how”. Great story, easy read, pragmatic succinct advice. Highly recommend for all leaders and aspiring leaders. - David Marquet Great story, easy read, pragmatic succinct advice. This book was recommended to me by a change manager as a good way to understand how teams can change to self-organising/leader-leader rather than the traditional leader-follower, as part of transitioning into Agile. More military detail than I was looking for, including usage (without explanation) of many navy terms. Some interesting leadership ideas, but few that weren't covered better in Good to Great, which this book refers to. This a military memoir about changing team habits around following orders and developing a culture of responsibility. I both enjoyed the story of David’s career progression and the nuggets of wisdom in relation to leadership and culture change. This was an excellent book. 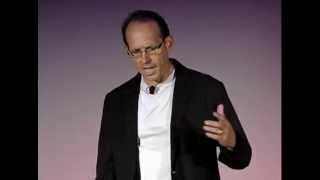 L. David Marquet superbly tells his story of resisting the traditional top-down, leader-follower structure in the US Navy in favor of a leader-leader approach. He shares the struggles that came with that shift, the discoveries he and his crew made along the way, and then the many successes that came for the crew of the USS Santa Fe. The concepts and strategies shared can be adapted to any setting involving leading others and developing leadership capacity. simple, straightforward, and concise. The book talks about how empowering everyone and giving the decision making to those at the frontline can help in todays organisations. David is the author of Turn the Ship Around! 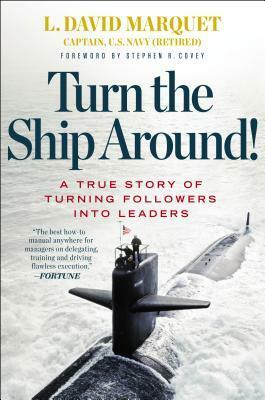 A True Story of Turning Followers Into Leaders and companion workbook, Turn Your Ship Around! Fortune magazine called the David Marquet imagines a ​world where everyone engages and contributes their full intellectual capacity, a place where people are healthier and happier because they have more control over their work–a place where everyone is a leader.